After a storied history, fully of historical high points and unfortunate low points, a new rendition of Diamond Head is back with a new studio album, All Will Be Revealed. As far as personnel goes, one very noteworthy lineup change must be mentioned. Guitarist Brian Tatler and vocalist Sean Harris were the long time core of Diamond Head. The two brought us the quintessential NWOBHM classic, Lightning to the Nations, and then endured many breakup and reformations over the past 2+ decades to release albums sporadically. Now, original vocalist Sean Harris is gone, replaced by Nick Tart. This leaves Brian Tatler as the lone surviving original member of the band. While not close to the impact of their early 80's sound, or even too similar in sound, Diamond Head has released a good album some 25+ years after they burst onto the music scene. New vocalist Nick Tart has a very bluesy, Robert Plant meets Sammy Hagar like voice. As a result, the 2005 version of Diamond Head takes on a bit more bluesy sound than pervious material. Still, the guitar work of Brian Tatler remains the defining aspect of Diamond Head. Heavy, deliberate riffs ala Black Sabbath can be found all over the album. The soloing and shredding however, is not as pronounced and prevalent as in the past, something that I would have liked to see more of. Two of the first four songs of the album, Give It To Me and Fallen Angel are two obvious examples of the bands's bluesy Zeppelin meets early solo Sammy Hagar style of bluesy rock. Lost at Sea features some heavy rhythm work, and soaring vocals from Nick Tart, thus becoming on of the highlights of the album. Broken Pieces is a driving anthem that features some nice shredding, thundering riffs, and soaring vocals that the band is known for. The band delivers this in the updated, more bluesy style of the band, but it works nonetheless. I wish more of the album would have hit me like these songs. Unfortunately, songs such as the title track are good, but as I mentioned before, fall a bit flat in terms of impact and complexity of songwriting. Also, mediocre mid tempo songs such as Come Alive feature a nice heavy groove, but its lack of intensity and dull chorus ensures that it falls flat on the ground. Thus, I regard this album to be an enjoyable listen that certainly has its moments, but not an album that will stay in my listening rotation for over the long haul. Simply put, it doesn't feature any songs that I would consider beyond "good," and in the "killer" range. A couple of mediocre and forgettable tracks are sprinkled amongst a largely decent to good album. As I said though, Brian Tatler dishes out a steady diet of riffs that Metallica only dream they could write today. Nick Tart has a passionate and powerful voice, but perhaps not as adventurous as his predecessor. However, I would say that he does a fine job in filling some pretty big shoes of Sean Harris. The songs on this album suit his voice very well. 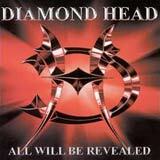 The production is very raw and simple, not much different from the era in which Diamond Head was born. However, I do think the rhythm section was shortchanged a bit during the mixing of the album. The bottom end sounds a bit thin, and thus depletes the songs of a big, thunderous sound. Still, the rhythm section is tight, and downright heavy in their playing at times, but thin at the same time. Considering the lineup changes, and considerable down time this band has experienced, Diamond Head has come up with an album about as good as I could have expected from them. It doesn't match their early work, nor is it stylistically the same, but that's a rather tall order, I must say. The band is different now, but this new incarnation of Diamond Head is capable of delivering good music to their faithful. I will enjoy it for what it is. If you like blues tinged heavy rock/metal backed by solid riffs, you should give this album a try. Long time fans of Diamond Head may have mixed feelings on this one, but the latest batch of riffs by Brian Tatler will certainly by a highlight for you.